Shopping Cart Defense is a new Tower Defense game where you are invaded from hundreds of Shopping Cart Heroes! Read more details for Shopping Cart Defense and watch the Full Video Walkthrough for Shopping Cart Defense. Hundreds of thousands Shopping Cart Heroes, accompanied by their brave stickman buddies, have invaded your land! Only you are able to play this cool TD game and put an end of this stickman invasion! Welcome to Shopping Cart Defense! And below is the video walkthrough for Shopping Cart Defense levels 1,2 and 3. 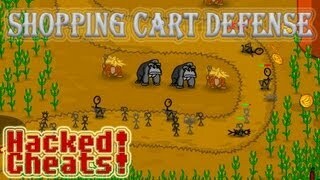 Enjoy playing Shopping Cart Defense - new TD game only at PlayTowerDefenseGames.com!